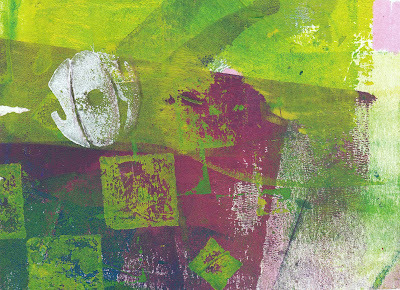 Artist Silvia Fedorova, who, with designer Julia Kunovska, runs Galeria X in Bratislava, sent this New Year card. 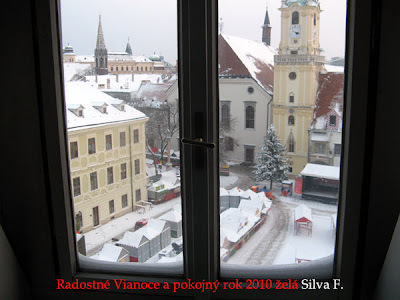 It shows the view from Silvia's apartment window, up above one of the central squares in Bratislava. 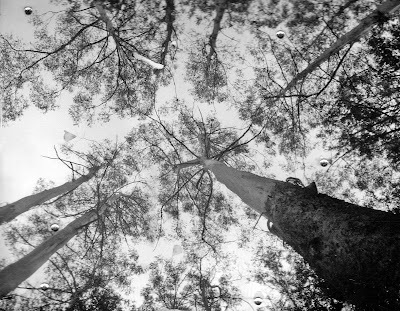 Silvia sends the same view each year, but each year it's different. I was waiting for it. 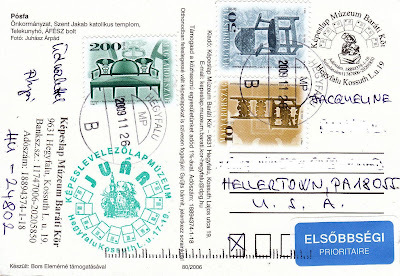 The same postcrosser (below) sent this very cool stamp! 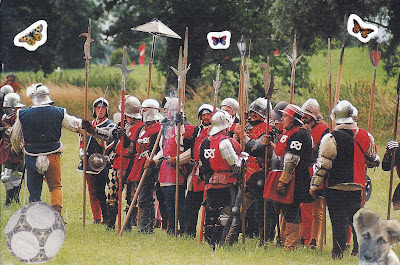 A British postcrosser made this amusing alteration of a card from the Tewkesbury Medieval Festival. The last time I was in England I happened to visit Tewkesbury Abbey. As I recall, we then had some good scones at a comfy kind of tearoom nearby. 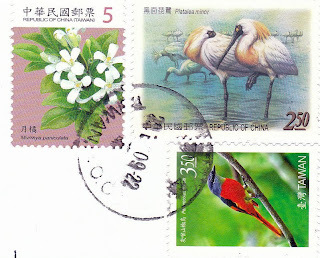 Interesting stamps from Taiwan (love the birds) and the United States. 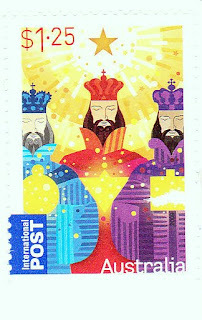 I was disappointed that this year my local post office had only Christmas stamps. 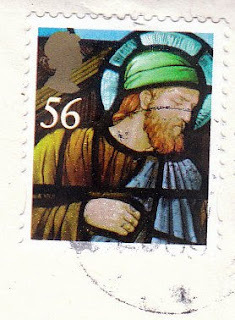 In other years, Hanukkah, Kwanzaa, or Eid stamps were available. 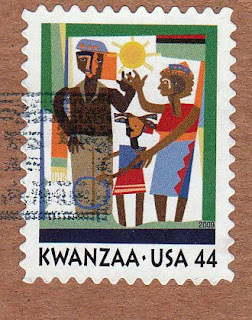 I was happy to get this Kwanzaa stamp on a card from Priscilla. 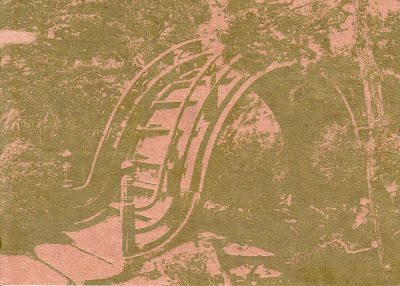 Priscilla sent this postcard, one of a series made by a San Francisco artist of the Japanese garden in Golden Gate Bridge. 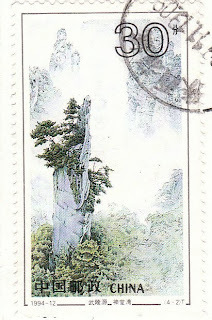 This one shows the Moon Bridge, popular with children, she writes, for climbing. I picked these postcards up yesterday at the Brandywine River Museum. The bottom one shows the museum at Christmastime. 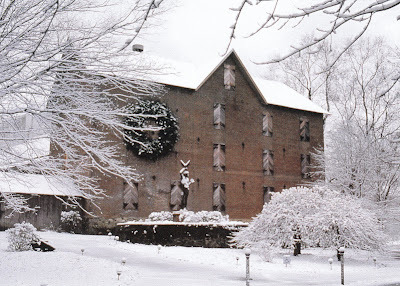 It is cold enough this week for it to look like this but the weekend's heavy rains had washed all snow away. 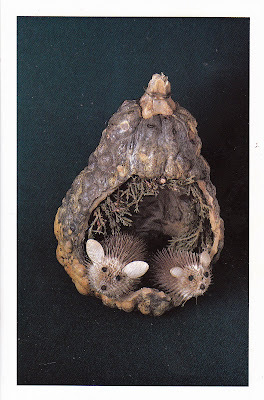 The top card shows one of the Brandywine critters, the tree decorations made each year by museum volunteers of local natural materials. 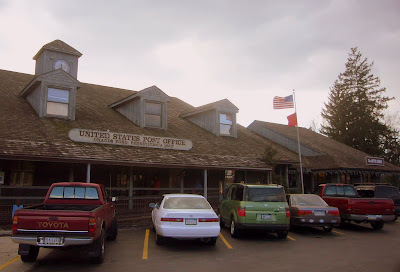 This afternoon, on the way back from the Brandywine River Museum in Chadds Ford, Pennsylvania, I took some photos of the local post office. It's in a 'quaint' little strip mall nearby and was as insanely busy as the museum itself. This is another unorthodox New Year card, but I know someone who often references polar bears in her work and it seems perfect for her. And there is a sad connection to the Year of the Tiger in that both animals are being sent on their way to extinction. I made some postcards from a photo I took 15 or 16 years ago. 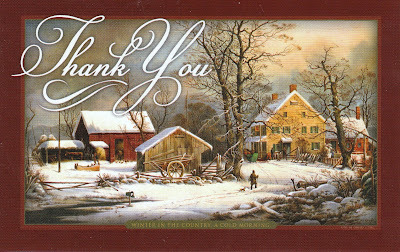 I'm using them for thank-you notes and for some New Year's cards, even though 2010 is the year of the tiger, not horse. 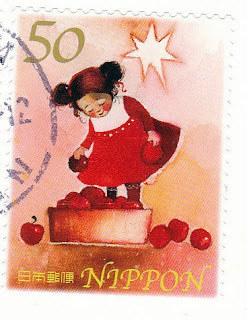 I love this stamp from Japan, which was on a Christmas card from that country. My mother turned to postcards this year for both Christmas and New Year's. 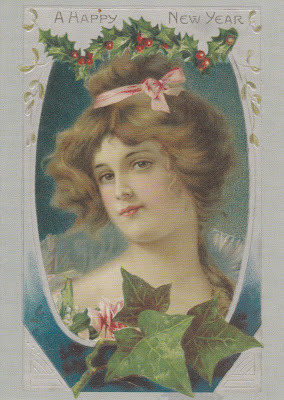 This one looks like Christmas but is for New Year's. 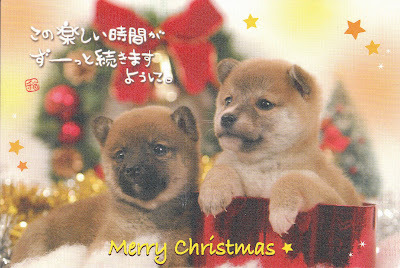 A Japanese postcrosser sent this sweet Christmas postcard. The Japanese is a wish for these happy times to go on and on. And with that I will say, Merry Christmas to all! 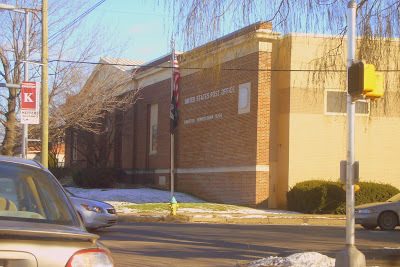 Each time I drive up to Kingston, Pennsylvania, I pass the main post office there and think about stopping to go inside. Yesterday I finally took a photo of it while waiting at the intersection. From this perspective it looks as if the facade of the original post office was retained on a renovation. Or maybe the front is just a faux look. 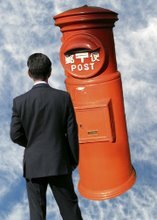 An Australian postcrosser made this card using photos that her boss took on a trip around their country. She also added rhinestones to the final image. Here they look like tiny blobs of water. Nice work! Top to bottom, beautiful birds (and tulips) from Belarus, stained glass from the United Kingdom, and a lyrical reindeer from Finland. 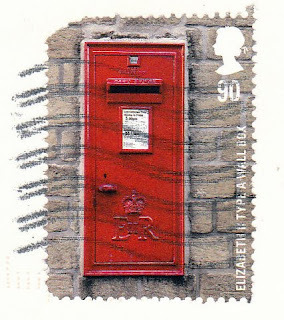 I've just seen an image on Postcrossing of the altered robin postcard which I posted yesterday. It turns out that even more things got "altered" en route, iincluding a perky party hat and bow tie on the robin and the balloon that it was clutching in its wing. (That explains the wavy black line on the card I received.) Part of the tag, too, was lost in the mail. Too bad! It was a cute, cheery card as sent, but these things happen. I'm happy I got to see the original. 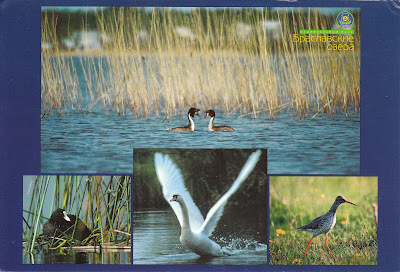 A postcrosser from Belarus sent this fab card, showing great crested grebes, a water hen, a swan, and a sandpiper. She wrote about the chicks she found at her parents' summer cottage and how amazing it was to watch them grow. 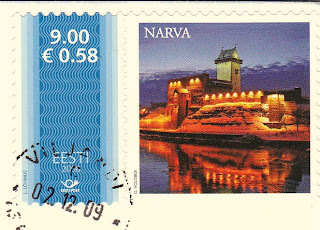 In a couple of days, I'll post the cool stamps she used on the card. 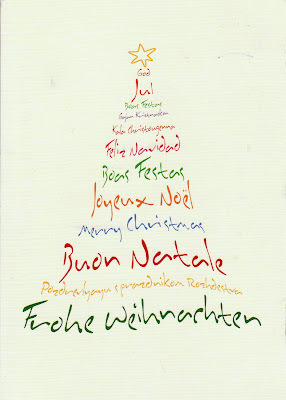 A German postcrossser altered this pretty Christmas card, with maybe a nod to the solstice and summer. Oddly, she said in her profile that she does not want to receive Christmas cards. 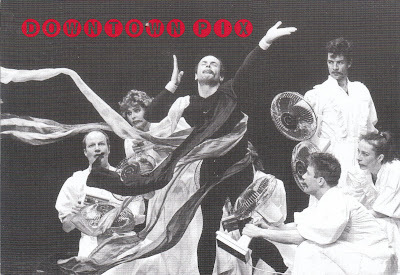 A Finnish postcrosser incorporated this photo into her card. She took the photo at the shore last January. 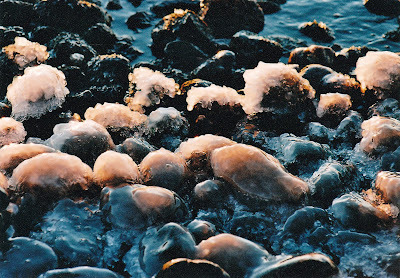 The icy rocks look like frosted bonbons. 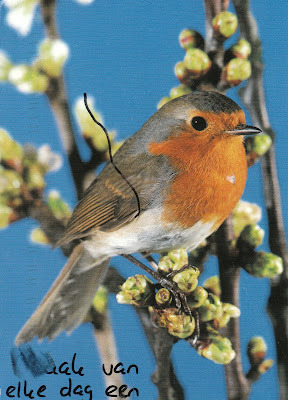 A Dutch postcrosser added a tag (it got smeared en route) to this pretty postcard of a robin. It means, Make every day a party. It makes me think that the birds at the feeder this morning are having a party in the snow. What else but a train on the holiday postcard from the Station Inn, the wonderful train-spotting inn in Cresson, Pennsylvania? 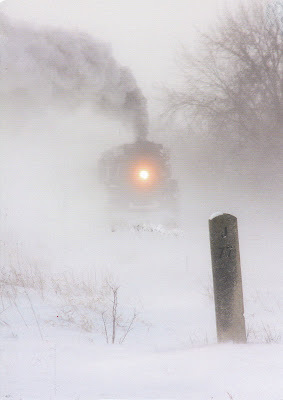 The photo was taken at Milepost 77 on the former Michigan Central Saginaw Branch. These wintry greetings came today from Dave the mail carrier. Thank you, Dave, for keeping the cards and letters coming and going! 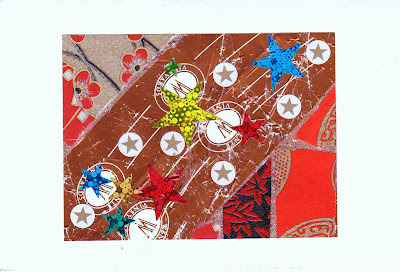 This collaged card from Priscilla is only the second handmade Christmas card to arrive this season. My mother went the retro postcard route for Christmas and New Year's. 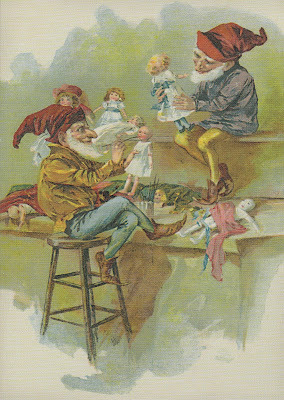 This one shows elves making dolls for holiday presents. 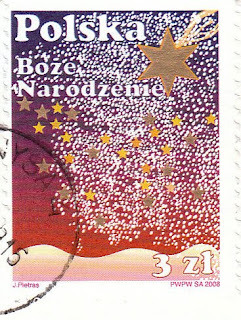 A pretty holiday stamp from Poland. 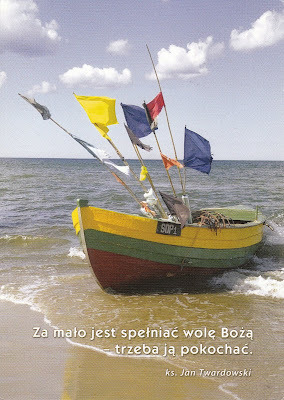 A Polish postcrosser sent this card but no explanation of the tag. It brought two things immediately to mind. One was Joanne B. Kaar's paperboat project from earlier this year, the other the shichi fukujin, or seven lucky gods, of Japan, who sail in a boat bearing health and wealth and happiness. The seven are particularly popular at New Year. A dentist in Minsk sent this glowing view of the castle of Mir, a favorite place of hers, which is located about 100 kilometers from Minsk. 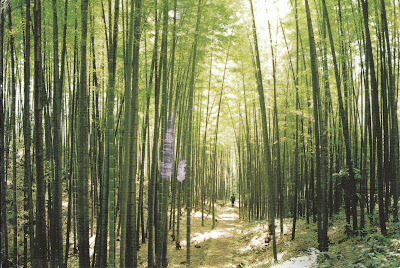 A Chinese postcrosser sent this fab postcard of a man in a bamboo grove. 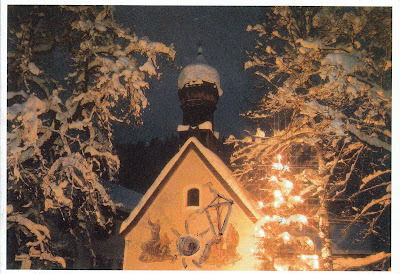 A pretty Christmas postcard from a postcrosser in Germany. 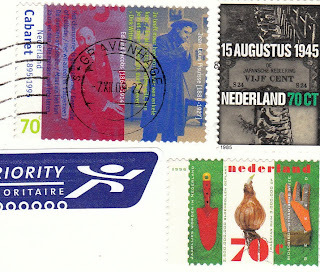 Top to bottom, stamps from Estonia, Japan, and the Netherlands. The Estonian one may be a repeat but it's dramatic enough to warrant a second post. 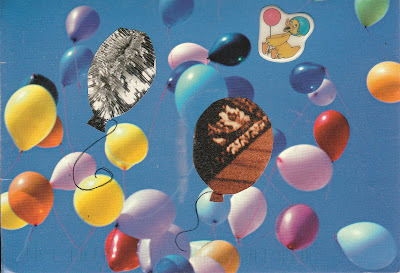 An Estonian postcrosser sent this happy card and wrote: "Since it's impossible to be unhappy when you have a balloon, I added a few hoping that the amount of happiness will increase with the number of balloons!" I wish her a colorful life filled with balloons! 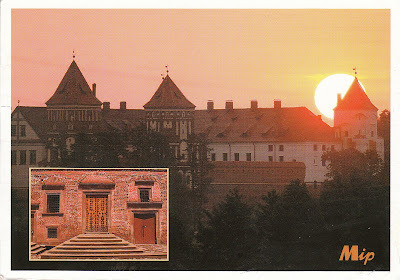 This postcrossing card from Hungary is all about the Juar Postcard Museum in Hegyfalu, which just happens to be in the region that some of my ancestors are from. 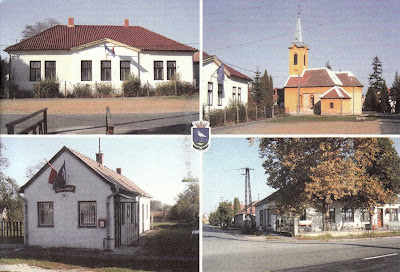 The museum was started in 2001 and is looking for postcards. Good luck to all involved. 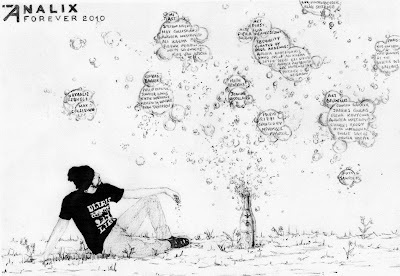 This Christmas postcard, made by friend Sandy Sapienza, brought song lyrics to mind. Downtown Pix, on from January 12 to April 3 at the Grey Art Gallery, New York University, in New York City, features more than 300 photographs and printed materials from the Downtown Collection in the Fales Library at NYU. 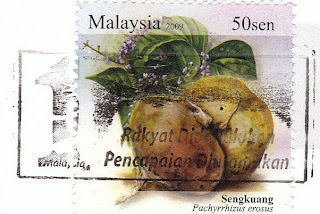 Two stamps, one a misty landscape from China and the other an illustration of a jicama, from Malaysia. Jicamas, native to Mexico, turn out to be popular in Southeast Asia. There's still time to see this satisfying exhibit at the Hunterdon Art Museum in Clinton, New Jersey, but make sure you don't miss it. Featuring 12 contemporary artists, it will make you think anew about some old techniques. 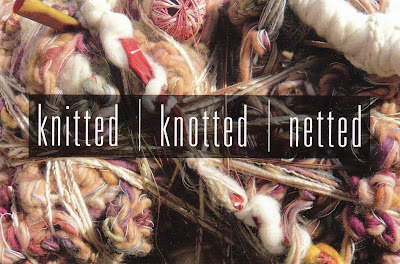 Knitted, Knotted, Netted runs until January 24. Sandy Sapienza made this handsome postcard from a photo of a tugboat that she took on a recent cruise with her husband Louis. 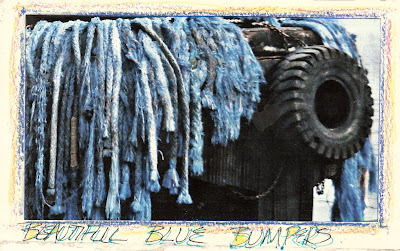 She wrote: "The tugboats in Nassau harbor had beautiful blue rope bumpers. Wonder how they got that rich color and luscious texture?" This was her favorite photo from the cruise. Love it! 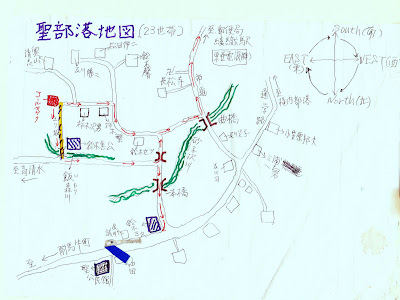 I made this postcard from a map that my last landlord in Japan drew for me so that I would know all of my neighbors in our hamlet. He brought it to my house a couple of days after I moved in. I was touched and impressed. The man had lost an arm in an accident as an adult and had had to relearn his approach to life. 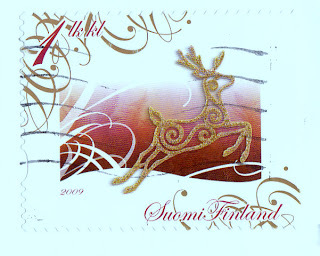 This Christmas stamp was on a pretty postcard from Australia. This was part of a card from the American Visionary Art Museum, a national treasure. 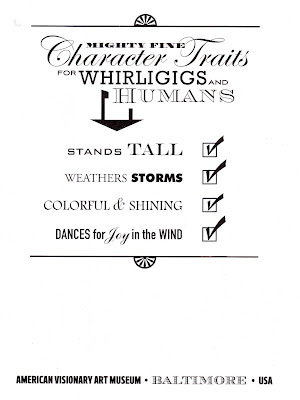 The other part showed a giant whirligig, made by Vollis Simpson and now in the museum's permanent collection. Simpson, a 90-year-old farmer, decided at age 60 that he had to do something with all the junk he had and started making whirligigs or, as he calls them, 'joy machines'. 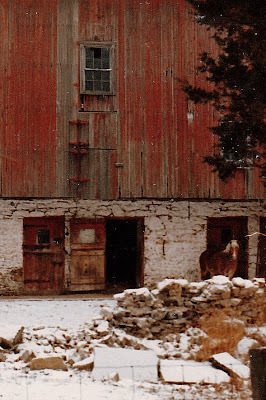 You can visit his Windmill Farm in Lucama, North Carolina. 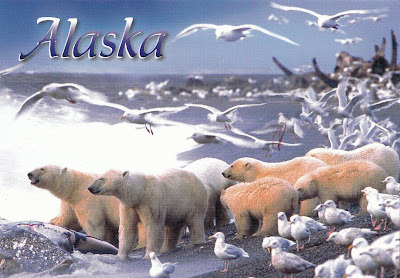 I'm sending this postcard to a postcrosser who says she likes cats and astronomy. It's an illustration for a Miyazawa Kenji short story called Yamaneko to donguri, about some acorns who want a wild cat to decide who is the best. It sounds goofy but it's a sweet tale (oops). I like the way the acorns mimic a constellation, suggesting Kenji's passion for astronomy. 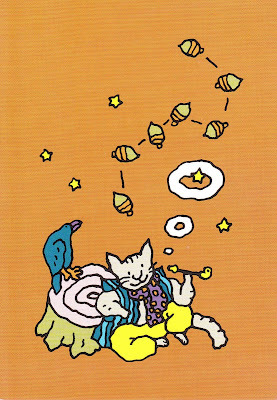 Actually, I like everything about this card, from the wild cat's polka dot muffler to the blue bird on the stump.